Kasie West does a great job of delivering stories that are fun to read with swoon. 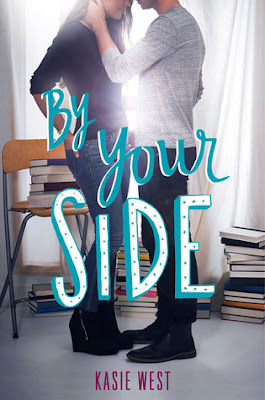 By Your Side definitely had those super cute swoon-worthy moments but It does deal with some issues, especially mental health. Which I thought was executed well through the main character.. Autumn was one of those characters that I liked for most of the book but there was definitely times where she annoyed me. I was frustrated with the most towards the end of the book when I felt she should have more faith in her friends. I liked how Autumn’s anxiety is dealt with and shown. You really get an understanding of how she feels and how people who don’t know would perceive it. I really liked Dax. He is supposed to be the “bad guy” but it turns out that he was dropped into bad circumstances. None of his doing. He’s very calm and collected but I think it’s more because he doesn’t want to let anyone in. I wish there was a little more with his behind the scenes life. Only because of something that happens in the end of the book that I felt was a little unresolved. I had mixed feelings about the Jeff situation. Not because of the love triangle or anything, just that it felt too easy. I’m not sure how to explain that really. My favorite part of the book was Autumn and Dax being locked in the library. Ya I thought it was a little unrealistic that they couldn’t find a phone. Especially this day and age but I didn’t care. I thought all their interactions from beginning to end where great. They don’t become instant friends but being stuck together they find common ground. They start to feel close because they are seeing sides that nobody else sees. The relationship between Autumn and Dax is really what sold me on the book in it’s entirety. They just had such terrific chemistry. I really loved Autumn’s group of friends. It was nice to have a book where people are not backstabbing you or turning on you because you have a problem. Dallin’s frustrations with Autumn are completely legit, even if he’s being a jerk before they work it out. I also like Autumn’s family and how close they are. I would consider the book to pretty adorable. I really liked Autumn and Dax and their chemistry. It makes for a fun read. I liked this one a lot, but it isn't my favorite Kasie West either. My favorite part was when they were locked in the library, too. I also found it peculiar that they couldn't get to a phone (I work in a library, and our phones aren't locked away at night), but I was willing to go with it. This seems like a fun read! Will definitely have to check it out.